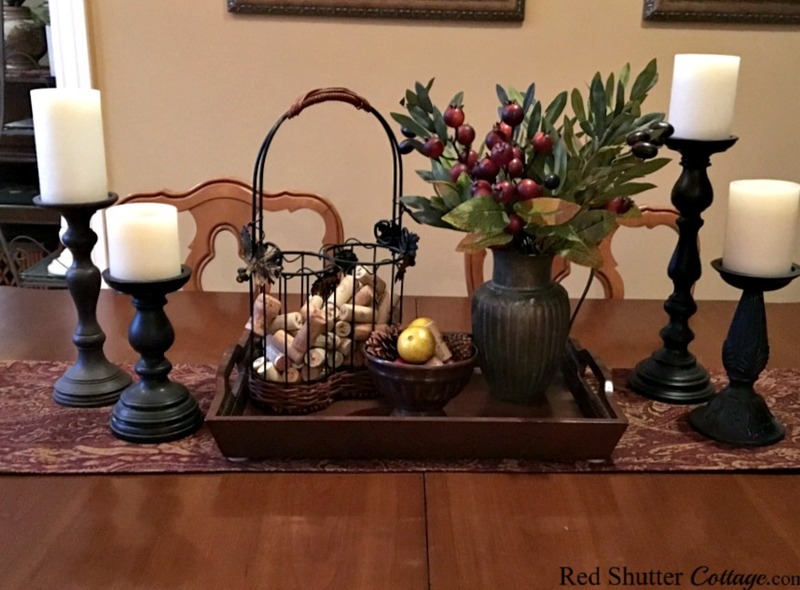 Here are some ideas for creating a Winter dining table vignette. I knew they would not work for Fall or Christmas, so I tossed them into one of my white pitchers, and stuck the pitcher on my baker’s rack in my office. For the next few months, there they sat, patiently waiting for my attention. 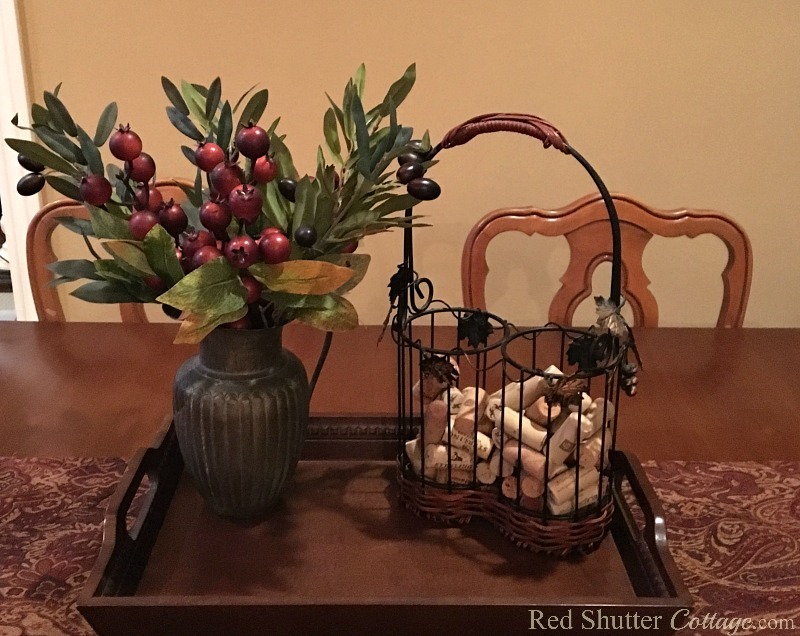 Towards the end of December, I knew I wanted to incorporate the branches into a dining table vignette. And Winter would be the perfect opportunity to do so. As I mentioned, I had placed them in a white pitcher, but there was quite a bit of contrast and no real harmony between the colors of the branches and the white pitcher. But sitting on the same shelf on the baker’s rack was my mother’s pewter pitcher. I could easily see that the branches were a better match to the pewter pitcher. Let me just stop here and say that what I love about Winter is that there are no real decorating parameters. It’s kind of a free-for-all season; you can decorate for winter however you like. There are blogs that show neutral winter white rooms, and they are absolutely lovely. Some people go straight to Spring, bringing it the palette of pretty pastels and brighter colors. 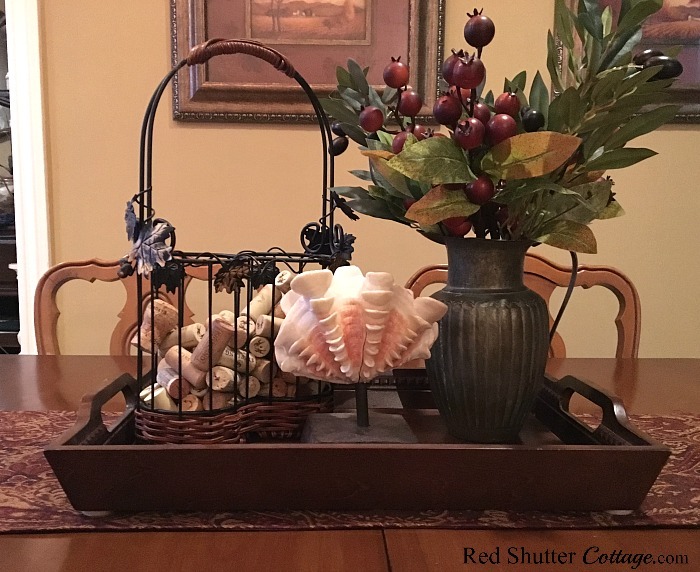 For me personally, I like to pull from both and Fall and Christmas and incorporate natural components: pine cones, twig balls, branches, cranberry balls, and wine corks. I like to use darker colors and heavier textures, and fabrics with richness and depth. 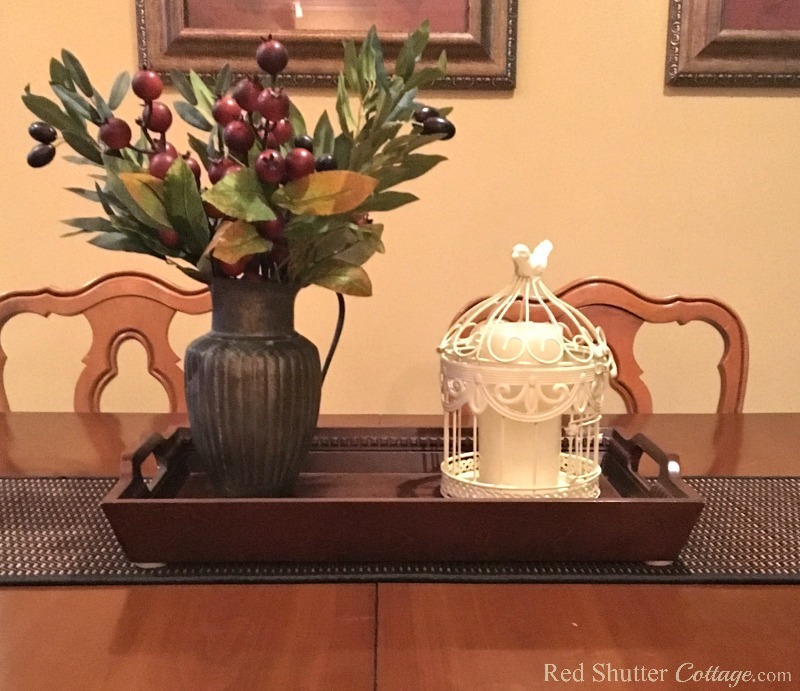 So that mindset is what propelled me towards building this dining table vignette. Here are few versions I went through to build this vignette. Some of them actually work (and some of them don’t). 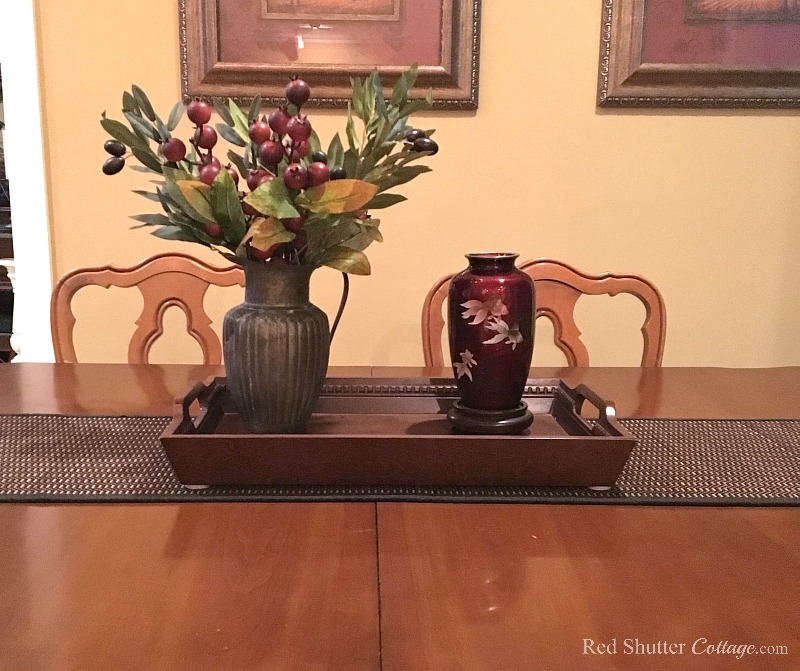 At this point, I swapped out the very simple runner and replaced it with this patterned runner. The colors in this runner work well with the color of the pods on the branch and the fabric mat in the pictures hanging on the wall. I made my final decision simply based on my personal preference. As I mentioned before, I love how the branches look in the pewter pitcher. 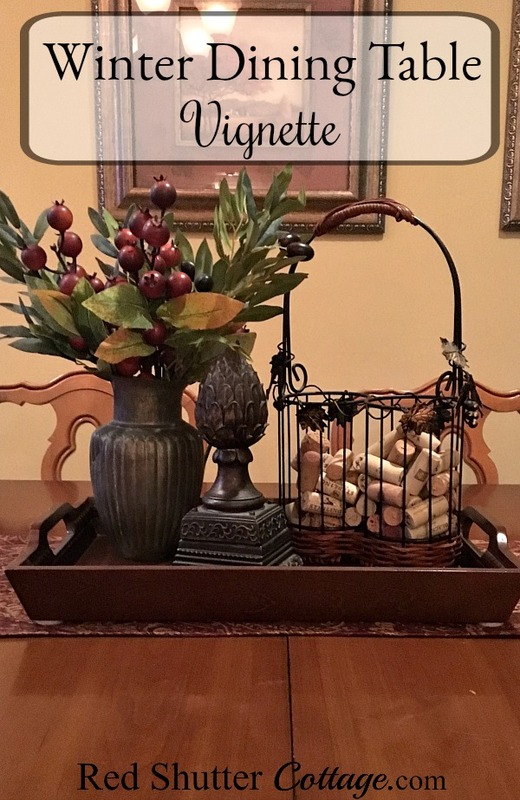 The wrought iron wine bottle holder came from a thrift shop; I filled it with my collection of wine corks. 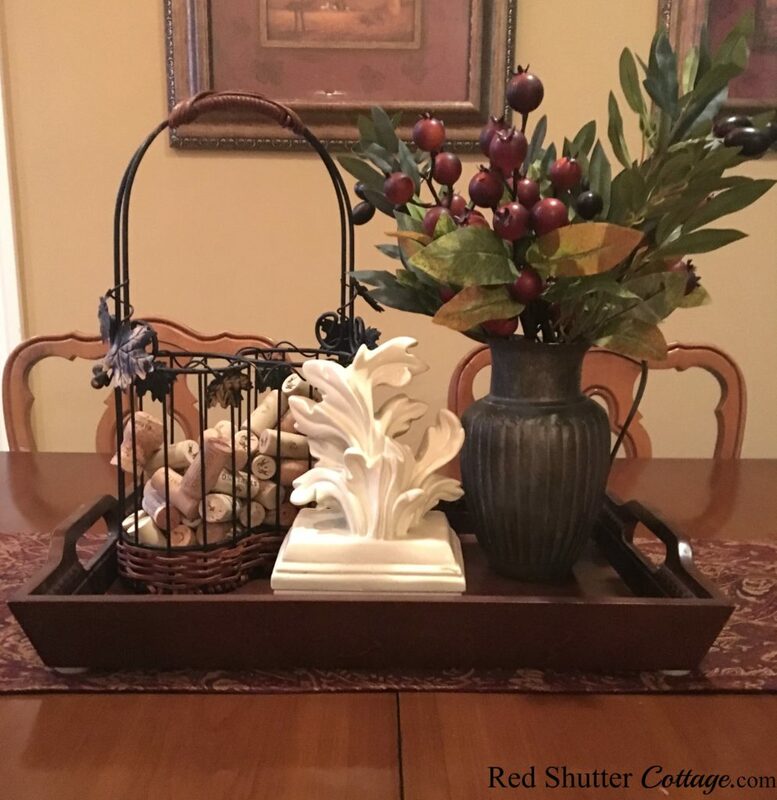 The wooden tray was a garage sale find, and the footed little bowl I picked up at a wholesale florist shop. I just filled it with pine cones, wine corks, and faux pears. 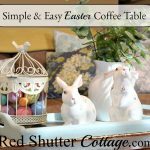 The runner came from Home Goods and the pictures on the wall came from a consignment shop. And then when I added the candle holders, it really took on a personality! 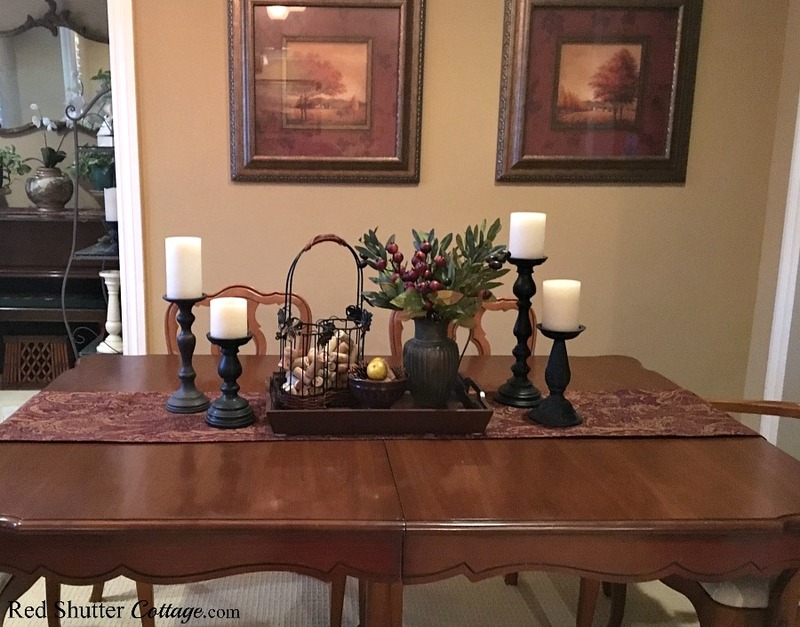 That’s the fun in building any vignette, including a Winter dining table vignette. Stretch your creativity by trying different combinations; looking for harmony between colors or finishes, or creating the exact dynamic of height and depth that keeps the eye interested. 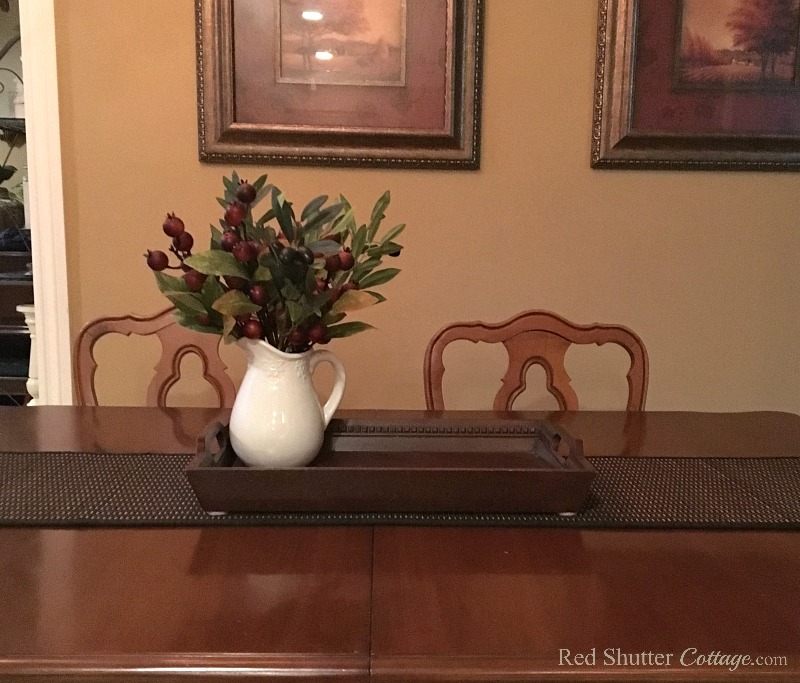 The various pieces and items in this Winter dining table vignette came together slowly. It really is all about collecting items that catch your eye and speak to you. It’s not about talent; it’s about paying attention to what you are drawn to, having the patience to wait for it, and taking action when you recognize it. And yes, we all make mistakes…I’ve made some humdingers. But over the years, your collection of loved pieces comes together and really reflects your taste, your style, and who you are. 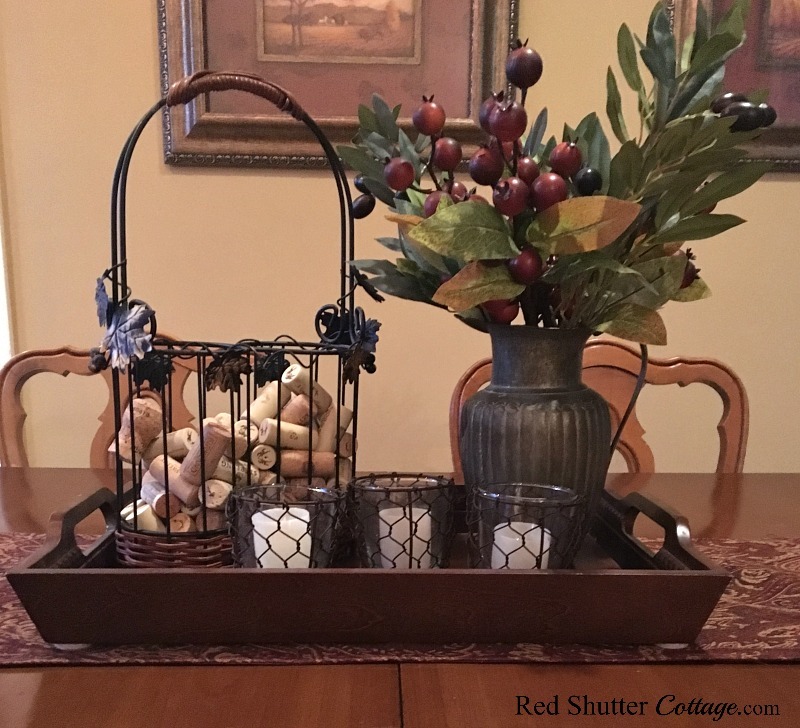 For more ideas on creating dining table vignettes, please read my Fall Dining Table Vignettes post here or this post here for a Summer Dining Table Vignette. Previous Post: « How to always have cooked and shredded chicken! Thank you, Nancy! When there’s a cat or two stretched out on the dining table, it starts to look a little wonky! 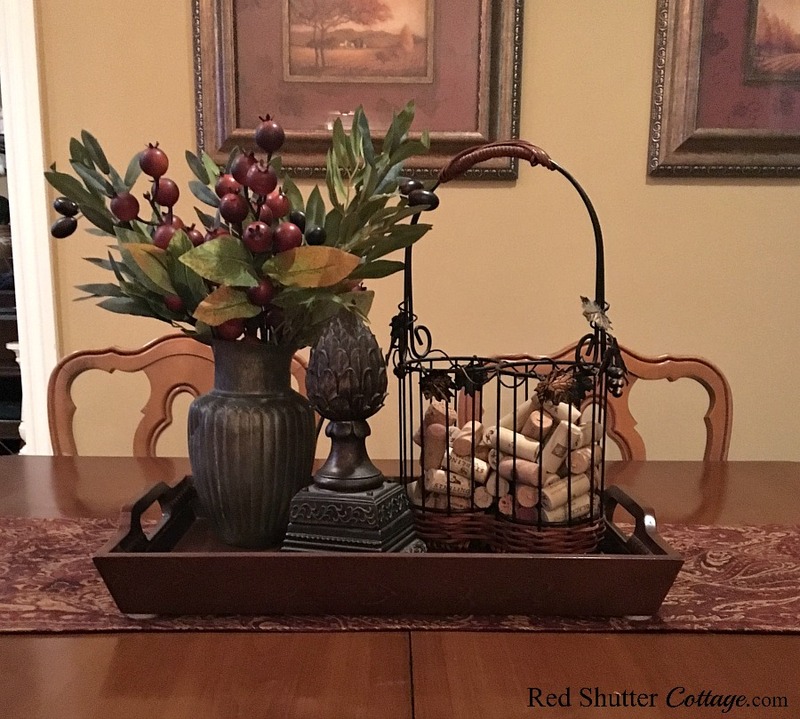 Your tablescape looks great! I really like the pewter pitcher with the olive branches. I think it’s helpful when you share your thought process and not just the final result. Thank you – I am not sure it would have occurred to me to combine the two unless they were next to each other. As I was putting the various groupings together, I realized there were 3 or 4 different vignettes I could have created. I think that’s what makes it so fun! Oh I buy things just like that when it’s too good to pass up. Like them in the white pitcher and in your beautiful vignette. Thank you, Carol! That’s the best way I have found to collect things that really make you smile!